The dirty gym clothes I hadn't yet bothered to wash went right back on this morning within five minutes of waking up. Sneakers laced and an almost-battery-dead ipod in my hoodie pocket, I wandered out the door, stopping briefly at Jojo's for a large to-go cup of coffee. I didn't have time to wait around for skim milk, so I splashed some half-and-half in there (which I hate), started chugging it, and made my way down the rest of the block to the snazziest building in downtown Hartford, a 35-floor apartment complex called Hartford 21. 21, while unrelated to the number of floors, is a good denotation of this building: it's ritzy and sort of stupid like a blackjack game, or a kid on their twenty-first birthday ordering their first legal martini. I walked in the doors, signed some waivers, chugged more coffee, picked up my number, and got in a line, all before I was really awake. Within eight minutes of entering the building I was at the starting line of a stair climb. Just as I felt I was really waking up, someone said, "GOOD LUCK! GO!," I hit play on Stronger (I'll let you guess whether it was Kelly, Kanye, or Britney) and began to sprint up 36 flights of stairs. Within about seven minutes, I was done, and headed home to make breakfast. I didn't do a great job on the run-- but I did it, and that was enough. I'm a terrible runner. My friends have heard about my informal standoffs with a man who runs on crutches faster than I do, or the guy who appears to be over eighty who routinely streaks by me in Hartford races, or the little kids who dash past while chatting during the Turkey Trots. I am slow. I have a pathetic stride. ("Greg," I say, "the barefoot running guy says that shortening your stride is better for you," "Julia," Greg says, "your feet are barely clearing a shuffle.") I make weird breathing sounds, talk to myself, drop my arms too low. Trust me. I'm bad. But I have come to like it. A few times I have hit a clear runner's high and floated along a few miles without convincing myself to keep going. Mostly, running is so hard that it's an act of mediation: keep going. Keep going. Keep going. I like how hard it is, and I love that there are a thousand different ways to set goals, a thousand different achievements possible. Personal records, new races, mileage, new routes. The best thing about being bad at something is that you know you can improve a hundred times over. My new years' resolution was to run one race a month for the year of 2012. 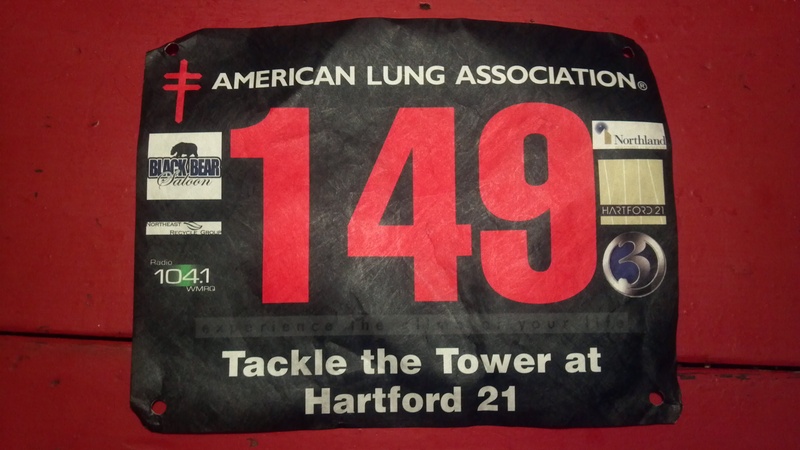 I've done three: a Cupid's Chase 5k, the O'Hartford 5k (winter races are so holiday-based), and the stair climb. Each time I don't really feel like going. In today's case, I didn't even want to get out of bed. But I've signed up-- I've paid, and I really should just get it done. I want to be doing longer distances; I want to be working out two or three hours a day. Of course, that's impossible. I just tell myself, "do something. Do anything. That's enough." Sometimes it ends up being just walking briskly the mile and a half to work. Sometimes it's a nine mile loop. I'm going to tell you guys something that is probably already apparent: writing has become very hard lately. I don't make enough time, mostly mentally. I used to be a dogwalker and had all day to think things over. Now I don't. I get home at ten or eleven and I'm happy to read, but writing is harder. It requires so much focus and perfectionism and creativity and taste and time and voice. It's not something I ever want to be sloppy with. Tonight, I'm tired. I'm tired from the stair race, I'm tired from an hour-long children's improv show I did with Sea Tea, I'm tired from socializing with everyone for an hour afterwards, I'm tired from doing my finances as soon as I got home, and I'm tired from even looking at my to-do list. I'm just about to go to bed, and it's ten-thirty-- shockingly early for me. That's like 7:30 to a normal person. But I said to myself, "no! Goddamn it. I have to write tonight." This is a blog post not half as good as the others. I took the picture with my phone twenty minutes ago. I don't even have a real story to tell. This post isn't going to launch the next phase of my writing career, or earn me any new subscribers, or elicit any comments. I'm trying to just do something: the equivalent of a slow mile on the treadmill that will bring me no immediate pride. A tiny workout. A tiny idea. A little training. As I was writing I almost hit "save draft" many times. But no. Keep going. Keep going. Keep going. Keep going.